People who visit the Paracas National Reserve in Peru's southern coastal desert, often refer to the prolific wildlife and the great scenery as the "Galapagos of Peru." Located on the Paracas Peninsula, the huge reserve includes more than 700,000 acres (280,000 hectares) of rugged shoreline, mountains, and desert. Birders flock to the reserve to see condors, pelicans and flamingos, Inca terns, and more as detailed in Coast of Paracas and Lima, a birding report by John van der Woude. Those interested in the marine life will see whales, dolphins, sea lions, called lobos del mar or sea wolves, Magellanic penguins, leatherneck turtles, hammerhead sharks and more. The Paracas Peninsula isn't as barren as it looks. The meeting of the cold Humboldt Current, rich with plankton and nutrients swept up from the ocean floor, meets the warmer tropical currents off-coast and provides feeding grounds for wildlife, plus superb seafood for human diners. In addition, the coastal fog, known as garúa adds a bit of moisture. The fog forms in winter when the Humboldt cools down the warmer air. Some seasonal plants, called Loma-Vegetation, have adapted to these conditions to survive the desert climate. The Islas Ballestas are seen only from the sea. Visitors may not land so as not to disturb the wildlife populations. 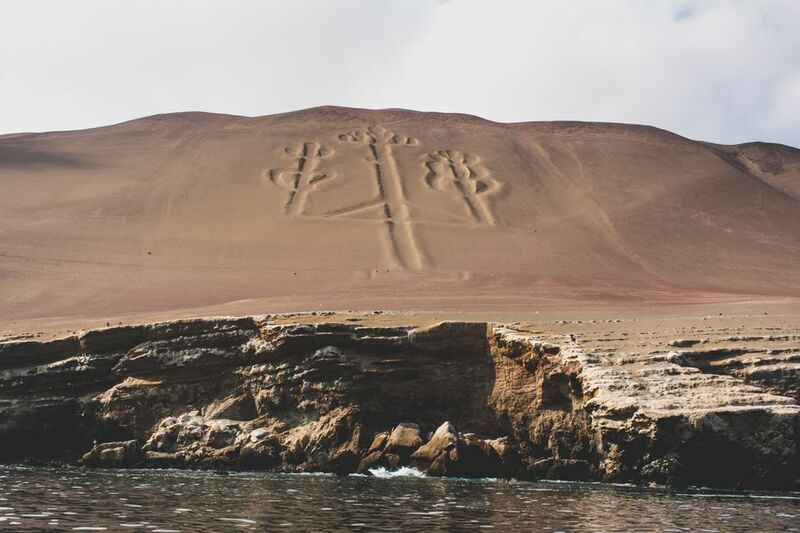 Boats from Paracas or Pisco leave daily and will stop so visitors can also see the drawing called El Candelabro on the hill overlooking the Bay of Paracas, which is similar to the Nazca Lines. The small town of Pisco is better known for the grape brandy called Pisco that makes the delicious and ubiquitous cocktail called the Pisco Sour. Although the southern coastal desert of Peru receives little or no annual rain, the fog and small oases have supported life for thousands of years. Long before the Incas ascent to power, the Paracas Culture, known for the high quality of its Paracas Textiles and weavings, thrived in this area. As elsewhere, the Paracas buried their dead in a sitting position, exemplified in these ParacasMummies. Visitors who come to see the Galapagos of Peru often enjoy exploring the Nazca and Paracas regions of Peru. If you'd like to stay in the area, check out the Hotel Paracas in Pisco. Check flights from your area to Lima and other locations in Peru. You can also browse for hotels and car rentals. However you visit, buen viaje! A Beginner's Guide to Puno Peru is the Folkloric Center of Peru.